Walking into Church Street Social that Sunday morning, the last thing on my mind was a photoshoot. What I wanted to do was to eat some ice-cream and check out bhane’s SS15 collection. But once I had dug into the delicious caramel ice cream and began to talk clothes with the amiable folk from bhane, I inadvertently got myself into a photoshoot and did three looks with them and here they are. Forget everything here and look at those kicks. The new Nike Air Max Zero’s really stand out don’t they? And they are super comfy too! Just this new ‘tazo’ shirt from bhane. Made in three different fabric blends, its light ,comfy and perfect for the blazing summer that is upon us now. The best thing about pieces from bhane is that they are easy to pair as you will see by the end of this post. With a differently patterned tie and chinos, it makes for a nice smart casual look. 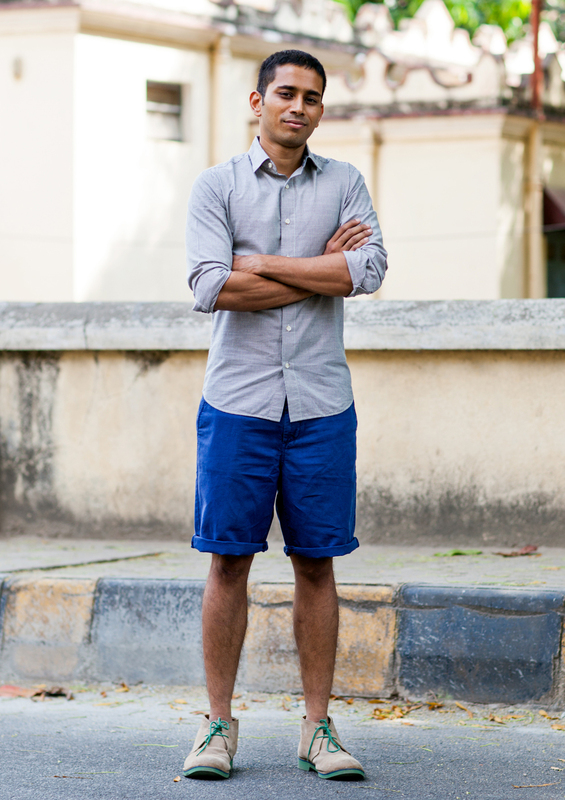 Pictured here is the Stone wash grey tazo shirt with some chino shorts and my koovs chukka boots. The green sole on these really lends some pop to the outfit. This is my favorite look from this series because it exudes ease and would work great for a weekend brunch situation, one that we seem to end up in more often nowadays, or just an evening out on the town. And in the final look here you can see me trying to smile. Doesn’t work. But let me draw your attention to the little bhane accessory on my chest. Yes bhane makes accessories for men and they have a lovely range of pins to choose from. A nice to way to embellish your outfits and stand out a little isn’t it? Checked shirts are a must have in any mans wardrobe and can be paired effortlessly. A year ago when I stumbled upon the bhane website and bought this paisley shirt that I still wear a lot, I knew that there was a lot more to come from this brand and they have delivered yet again. Whether its basic tees you are looking for or dress shirts, they have it all and more, in fabric that feels great on you. And being the friendly folk that they are, I feel that buying a bhane piece makes you part of a family of sorts. Come on, they give out free ice cream at pop-up shops. Doesn’t get better than that does it? So head over to the bhane website and check out some clothes from my favorite Indian brands. Next postNorth Goa – 12 Hours.